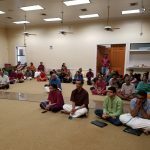 The Discourse was a two part series, with the first part being a 3 Day Katha at D/FW Hindu Temple Society, Irving Tx (Co sponsored by D/FW Hindu Temple Society and Kerala Hindu Society of North Texas). On 18th December the 3 Day Katha started at about 7:00 PM with Hanuman’s Prabhavam as the topic. Sri.Ramanujamji wonderfully explained Sri.Hanumanji’s eternal greatness with “Bhudhdhir Balam” sloka. It was great opening day session with 75 shrothas attending the satsang. Mahaprasad was served after the satsang. Earlier at about 6:30 PM Sri.Prabhu and group sung Bhajans. On 19th December, at about 1:30 PM the session started with Sri.Guruji’s Kirtans sung by Dallas GOD Members followed by Kuchela Upakhyanam discourse by Sri.Ramanujamji. Lord Krishna’s eternal friendship with Sudhama was enjoyed by 80 listeners. A light snack was served following the satsang. At about 5:00 PM, Gopa Kuteeram was started with a over whelming participation of 25 children. 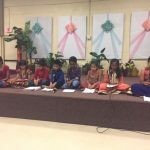 The children learnt “Karuna Moorthi Neeyalavo” kirtan with the meaning, “Krishnaya Vasudevaya” sloka and Dhamodhara leela story. The kids were divided in to two groups and they did a role play of the Dhamodhara leela. The children had the wonderful opportunity of interacting with Sri.Ramanujamji, who also distributed the participation certificates to the kids. On 20th December, once again the session started with Sri.Guruji Kirtans sung by Dallas GOD members at about 1:15 PM, followed by “Brindavana Leela” by Sri.Ramanujamji. 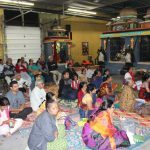 About 100 devotees who were present were immersed into Krishna leela from Krishna Jananam to Brindavana Leela during this marathon session which ended at about 5:15 PM with a small break in between. 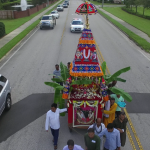 D/FW Hindu Temple Society honored Sri.Ramanujamji for his wonderful lectures and Dallas GOD satsang thanked D/FW Hindu Temple Society and Kerala Hindu Society of North Texas for providing the opportunity. As a later addition to the discourse series, at about 7:00 PM on 20th December, Sri.Ramanujamji gave a wonderful lecture at Shri Ram Mandhir, Plano, TX on “Spiritual Living – A Vital Balance for Modern Human”, which was fully enjoyed by the 65 listeners.